On Thin Ice explores the relationship between the Inuit and the modern state in the vast but lightly populated North American Arctic. 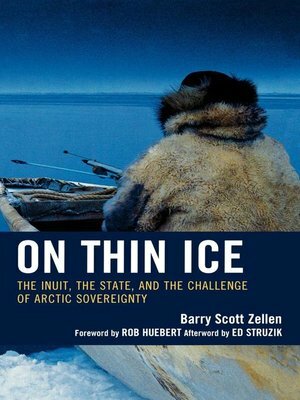 It chronicles the aspiration of the Inuit to participate in the formation and implementation of diplomatic and national security policies across the Arctic region and to contribute to the reconceptualization of Arctic Security, including the redefinition of the core values inherent in northern defense policy. With the warming of the Earth's climate, the Arctic rim states have paid increasing attention to the commercial opportunities, strategic challenges, and environmental risks of climate change. As the long isolation of the Arctic comes to an end, the Inuit who are indigenous to the region are showing tremendous diplomatic and political skills as they continue to work with the more populous states that assert sovereign control over the Arctic in an effort to mutually assert joint sovereignty across the region Published on the 50th anniversary of Ken Waltz's classic Man, the State and War, Zellen's On Thin Ice is at once a tribute to Waltz's elucidation of the three levels of analysis as well as an enhancement of his famous 'Three Images,' with the addition of a new 'Fourth Image' to describe a tribal level of analysis. This model remains salient in not only the Arctic where modern state sovereignty remains limited, but in many other conflict zones where tribal peoples retain many attributes of their indigenous sovereignty. Barry Scott Zellen is research director of the Arctic Security Project at the Center for Contemporary Conflict at the Naval Postgraduate School.